News: Bumblebee becomes the Top Dog on a 275 tire! It isn't often that we see something in drag racing that still puts us back in our seats and say DAMN, but that is exactly what happened yesterday when we received word from Jeff & Patrick Miller. When I perused social media this morning, it was no surprise the controversy I was seeing all over the place. Jeff and Patrick had posted a time slip from a pass they made at Darlington Dragway last night. For those that don't know, there are some rules set by certain promoters that racers aren't allowed to show times or slips. There are other promoters that allow class cars to run in their N/T classes and they just don't light the boards. So now we have a very divided community about this, there are those that are throwing an absolute fit about it and those that don't care. We certainly already knew the potential that Jeff and Patrick have with Bumblebee, which is the name of their beautiful blown yellow Camaro. Earlier this year we saw the Millers run plenty of class-based events where the boards were lit, so everyone knows the potential of this beast. That part should come as no surprise to anyone. 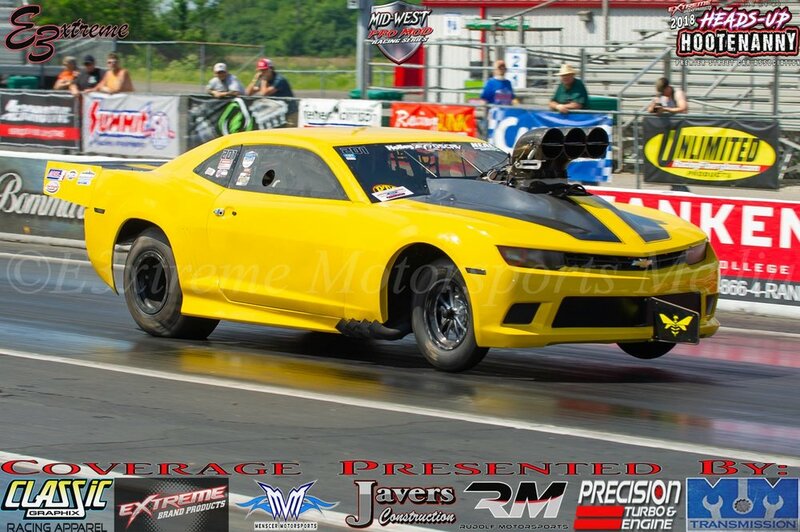 Lately, there has been a battle to see who was going to be the first to break into the 3.80's on a 275 drag radial tire. Just so you understand, these aren't X275, these are more of the Pro 275 setup, as there isn't as much limiting them as there is in X275. Previously, Don Lamana was really the gold standard on a 275 tire with his Pro Fab Performance Mustang. Earlier this year though, Ziff Hudson and his gorgeous Mustang came back into the fold after being down for updates. A few weeks back all the talk was about if Ziff ran in the .80's on a 275. Well, Ziff hasn't openly admitted to doing it, and we have no slip to say whether he did or not. So, the battle was now on between Ziff and Jeff on who would be the first to do it and either light the boards or share a slip. It was Jeff that did it first. Jeff and Patrick were at Darlington Dragway, and as most know, it is one the foremost premiere tracks in the country for 1/8th mile racing. Jimmy Bradshaw, along with his wife Dana, track owners DeeDee & Russell Miller have done everything imaginable to give racers the best surface in the country. It has been an all year process to get back to where they wanted to be, but last nights performance by Jeff and Patrick Miller (no relation to DeeDee and Russell), show that Darlington is back and ready to rock. So now onto the performance that Bumblebee dropped on us last night. How about a 3.898 at 194 mph on a 275/60 tire. Yes, folks, that's most likely smaller than what is on a lot of cars from the factory. A 1.0407 sixty-foot short time accompanied that pass as well. Shows us that the track was on kill and Patrick was making the right tuning choices. Not to bad for a kid barely old enough to order a beer on his own. This means that Bumblebee is officially the first car to run in the 3.80's on a 275. Jeff was asked last night if this was at the class weight and his simple, yet hammer dropping answer was "Yes". Essentially putting every other Pro 275 car on direct notice that Jeff and Patrick are the big dogs on the block when it comes to performance on a little bitty tire. All of this performance is controlled with a Holley EFI system, Menscer Motorsports shocks get the power planted and keeps it to the ground. Obviously, we aren't going to get into all the details that make Bumblebee the front-runner that it is, but also know that there is a little this and a little that to go along with assistance for TKM (The Kevin Mullins). So instead of talking about the first in the 3.70's on a 275, let us take a moment and actually enjoy this accomplishment because reaching feats that have never been reached in a sport that has been around since the second car was produced isn't something to be taken lightly. On a side note for those still reading, and crying about Jeff and Patrick posting their slip…NO ONE CARES ABOUT YOUR CRYING! !